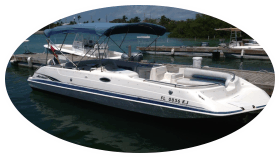 Aquatic Boat Rentals has four different boat rentals to choose from. They also offer 4 different rental options. You can rent by the hour, 1/2 day, full day or weekly rental. The Contender, their state of the art boat, is available for charters only. It's a great option for larger groups looking for a day on the water with an experienced captain. Rate: $1500 per day - includes experienced guide. Aquatic's offers a 20' center console Cuda Craft for rent that holds up to six people and is a good option for fisherman. The Contender is a larger boat that is reserved for specifically for larger groups of people. Aquatic's has two different Hurricane deck boats for you to choose from. They are 24' in length and one comes with a 225 hp four stroke and the second comes with a 150 hp engine. Aquatic offers a smaller boat for rent that is a good choice for accessing the shallower back country areas for flats fishing. The 15' Whaler holds up to four people and includes a 60hp motor. Aqautic offers a guided island jet ski tour. The wave runner tour departs from the Stock Island Cow Key Marina and takes you on a sightseeing adventure around Key West and more. You can also rent wave runners by the 1/2 day or full day. Aquatic Boat Rentals offers an excellent watersport bargain option for larger groups. They offer an all day inclusive trip on the water for up ten people. The trip includes snorkeling, sightseeing and more. They will provide all the gear. You can bring your own snacks and favorite beverages. The group all day package costs $650 for the entire group. Aquatic Boat Rentals offers two more guided tour options. Option one is a guided snorkel adventure out to the many reefs surrounding Key West. Aquatic will provide you with all the necessary gear. Option number two is a guided Sunset Tour that will take you to the western most edge of the island to view the spectacular Key West sunset. The tour departs from the Cow Key Marina approx. two hours before sunset. You are encouraged to bring along your favorite beverages and snacks for the trip. Murray Marine just off highway US1 Key West, Fl 33040. 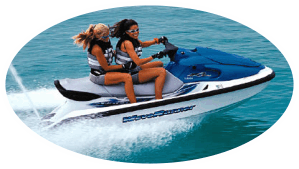 Specializing in Jet Ski Island Tours. Key West Vacation Rental Condo on the Beach!